Next weekend, we are going to commence our adventure in England. But before we do so, I thought I'd finish writing about our South Island adventure first. Whilst I thoroughly enjoyed Wanaka, Milford Sound was the highlight of my trip to the South Island. I say "my" because unfortunately, J missed out on this amazing trip. As much as I wanted him to be with me to experience the enchanting Milford Sound, he was quite unwell (but not unwell enough for me to give up the ultimate reason why I went to the South Island). To say the least, I left him in Queenstown while I ventured 12 hours away on a bus with some strangers. I left our hotel at around 0630am for a 0645am pick up. It was still dark but Queenstown felt like a safe place so I walked confidently to the bus stop on my own. The Cruise Milford bus arrived on time and when I showed my ticket to the driver, he asked where my companion was. I said he was unwell. The driver had this judgemental look on his face, almost telling me that I got stood up. Haha. Then he said, "well, he's gonna miss out on this lovely day". I smiled at him and said, "I know" and then moved on to find my seat. That was when I sort of felt sad because I was really looking forward to spending that day with J. But things always get better when you look at the brighter side of things. There were a couple of ladies in the bus that apparently were on the same bus the day before but didn't make it to Milford Sound because there was an avalanche and therefore, the roads were closed. We have already left Queenstown when the driver informed us that the roads remained closed, but apparently were expected to be opened at midday. So, the best thing that they could do was drive to Te Anau (the gateway to Fiordland National Park and Milford Sound) and take it from there. Good thing that J didn't come, I thought. He definitely wouldn't have been happy to travel on a bus that long then not make it in the end. This is why I didn't feel as guilty leaving him behind. In approximately two hours, we arrived in Te Anau. We stopped by a visitor's centre for breakfast. I must say that their selection of food was rather disappointing. But the typical Filipino that I am, of course I had "baon". Hehe. When we left the cafe, we still didn't know whether we would make it to Milford Sound or not, but our driver was optimistic so he carried on driving. The road from Te Anau to Milford Sound is very scenic (but zero network connection). I was overwhelmed I didn't know where to look first. Amazing sights in all angles. 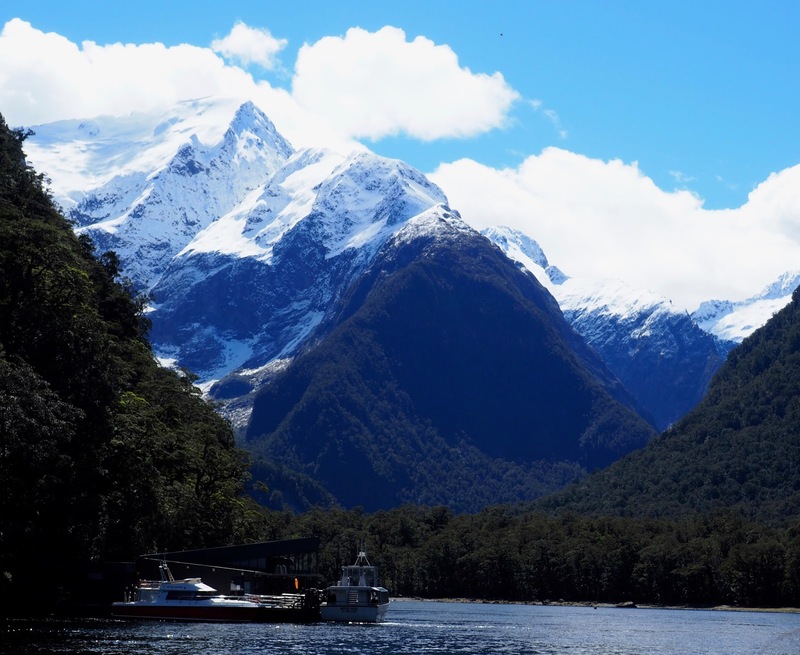 Our fist stop was at the incredibly beautiful Fiordland National Park. The openness of the field and the low dark clouds over snow-capped mountains made the place quite dramatic. Definitely a postcard worthy landscape (if only I could take photos better). Our next stop was Mirror Lakes. Apparently another beautiful sight but I couldn't appreciate it. I suppose you have to be there on a very calm and sunny day to be able to see a good reflection. Otherwise, it's just a murky reflection. Monkey Creek is another scenic stop. Just be careful with the Kea birds. My favourite part of this stop was drinking fresh water from the creek. I didn't even think twice in doing this because the water was crystal clear. It couldn't be as natural as that. Plus it was cold. Really delicious water. And then the moment of truth. As we approached the Homer tunnel, we were left wondering if we were able to pass through. The aftermath of the avalanche, seemingly minor, was still evident. We queued up for more than 15 minutes. I was losing hope when the red light suddenly turned green. Fourteen of us in the bus cheered and thank the heavens. Finally, we were definitely on our way to Milford Sound. We arrived in Milford Sound before 1pm. When I saw the fiord, I could only wish J was with me. It was the perfect weather and the place was purely mystical. I've not seen anything like it and all the time I was reminding myself how lucky I was to have been given the chance to see such an amazing place. To get the best of my Milford Sound experience, I made sure that I stayed in front of the boat for uninterrupted views, only to pay for it at some point. 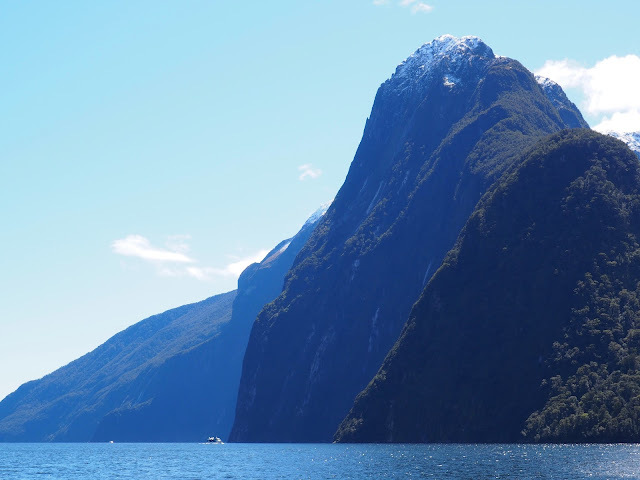 The stunning Mitre Peak greeted us as we sailed through calm water, amidst magnificent mountains. And the waterfalls. Oh, the waterfalls. There were more than I ever expected. Waterfalls after waterfalls. And they were all beautiful. I watched in awe as they cascade through the mountains. And then an unexpected thing happened. The captain threatened to take the boat underneath the waterfall. I thought he wasn't going to do it, so I didn't move. It was too late when I realised I was under it. Luckily, a stranger moved my bag. I wasn't sure how to react to that, but I suppose the whole experience became extra memorable because of that. Reading reviews on Milford Sound, some people were disappointed that they didn't see any dolphins. Well, I guess it was my lucky day because a couple of dolphins joined our voyage back to the dock. They were in front of the boat, just under it so it was quite a challenge to take photos of them. But nevertheless it was a wonderful sight. 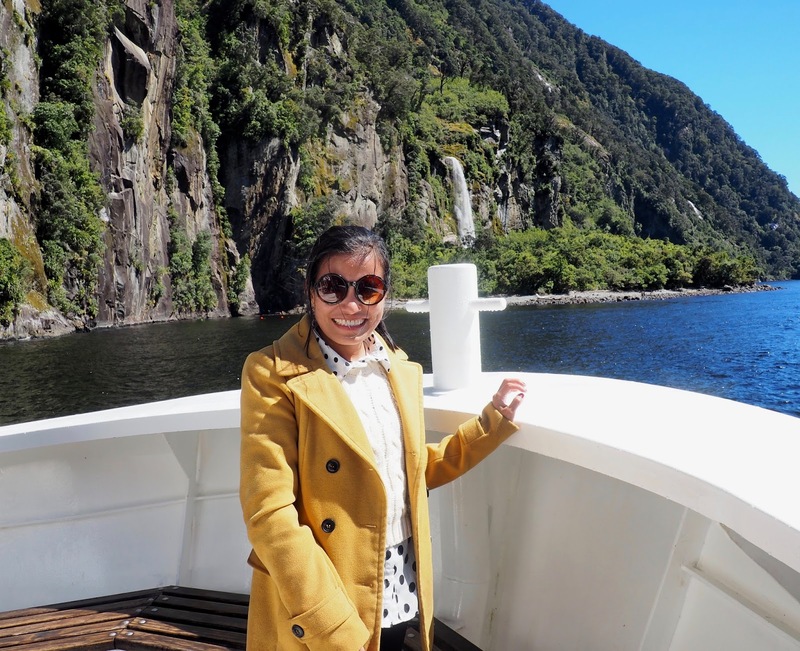 The two-hour Milford Sound cruise was pure grandeur. I am definitely running out of adjectives to describe this place. All I can say is that I am one lucky person. 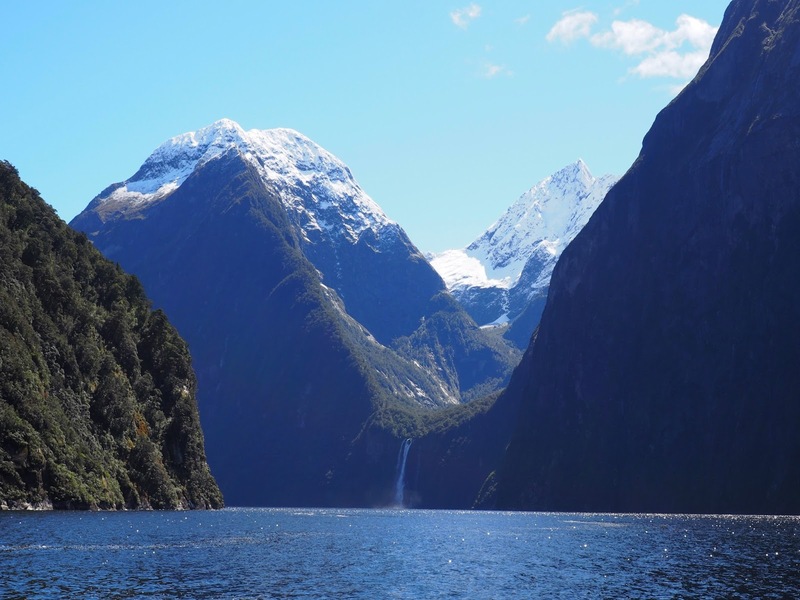 The 12-hour journey and $175/person trip to the Milford Sound was definitely worth it. Although it would have been better to experience such a wondrous place with J, he was never far from my mind. 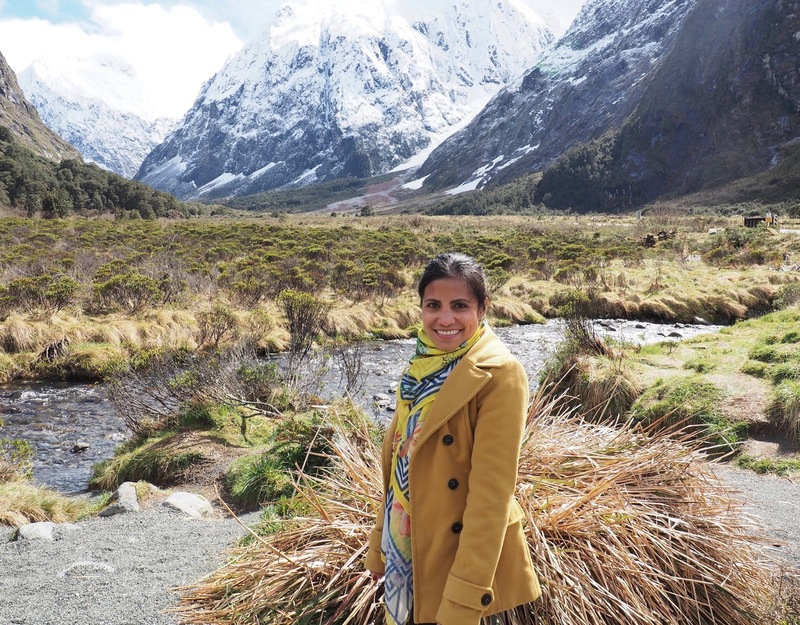 Milford Sound is my most memorable experience in New Zealand because for the first time in my life, I travelled to an unfamiliar place on my own. I was never a keen solo-traveller, and for me to be able to do just that for a day is a big accomplishment for me.